These crystals were grown by melting 1,4-dichlorobenzene, the main ingredient of mothballs, and then letting it cool down again in a closed container. Crystals will form on the inside like ripe on a cold winters day. You can see them more easily when you use a glass container of course. 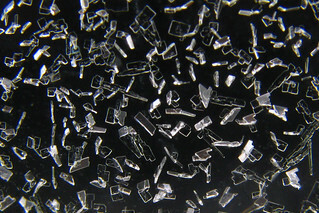 Crystals that are too big will fall down to the bottom, leaving only the smaller crystals on the glass surface.